Verisurf software offers advanced tools and capabilities for a wide range of applications. 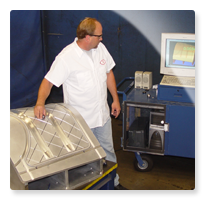 From tool building to periodic and automated inspection, users excel throughout the entire manufacturing process. Verisurf is the global leader in tool building software. Our state-of-the-art system – complete with the Virtual Gage™ – literally guides you through the tool building process in real-time using simple to understand graphic feedback. Built on a robust CAD/CAM engine, manufacturers can read CAD files on multiple levels for large assemblies, turning on and off details at will. With Verisurf, you seamlessly reduce the tool building process from months to mere weeks. Manufacturing operations must verify that processes and machined parts meet specifications and quality standards. Fulfilling these needs with Model Based Definition (MBD), Verisurf’s unparalleled software ensures Quality Assurance during product development and Quality Control of the final manufactured part. Verisurf also provides a full spectrum of documentation and reporting capabilities for enhanced efficiency throughout the entire product lifecycle. With Verisurf, you eliminate the backup in Quality Control and complete inspections in minutes, instead of hours or even days.